Gordon Brush manufactures high quality bottle brushes. The company's goal is to help its customers improve their productivity and profitability by providing them with high quality bottle brushes which suit their exact requirements. Got questions or don’t know what exactly you need? Contact Gordon Brush today; our products can fit your applications or we will create it! At Jenkins Brush Company, our bottle brushes clean, carry, conduct, apply, ground, grind, move, abrade or protect, separate, filter, combine and most importantly, last. With a variety of core and fill materials, Jenkins can custom design and manufacture bottle brushes that meet or exceed your specifications for functionality, durability, and cost efficiency. You may think that bottle brushes are not important, but they are as important as any other tool. A tool should provide its function in the most efficient way possible, which is why we pay attention to the design of each and every one of our products. If the design isn’t working, we change it! This is why our customers trust us year after year for their brushing needs. See what we’re about online! Brushes are used in a wide range of industries, and each type of brush has its own unique set of properties. That’s why our team at Sealeze can help point you in the right direction. Since the 1970’s, Sealeze has delivered unsurpassed quality products and superior customer service, and our team of dedicated staff members can help you find a solution. Contact us today to learn more! We manufacture a wide range of products, including bottle brushes, wire brushes, brooms, and more. Our brushes are uniquely designed to maximize performance. We believe that if our products are superior, then our customers will be happy. That has kept us as a leader in the industry since 1929. Visit us online or give us a call to find out more about our company. With us, we promise to put the customer fist 100 percent of the time. Our passion is our products, and with nearly 150 years of experience, we know our stuff. Bottle brushes, paint brushes, industrial brushes, and more- we only offer the highest quality at affordable prices. See how we can serve you by giving us a call or visiting us online today! At the Precision Brush Company, we know brushes. We provide top quality brushes of all kinds, including bottle brushes, strip brushes, metal brushes, natural brushes, and many more. We have thousands of brushes to choose from and can even create custom brushes to meet your exact needs. Look to the industry leader in the Ohio brush industry for your next brushing project! We have over 20,000 square feet of manufacturing space that we can dedicate to fulfilling your order of bottle brushes, or whatever it is! With so much space, we can deliver your products sooner. We work hard to keep prices low so our customers can save their money for other things. We deliver fast so you can get back to work quickly. To learn more, visit us online today! 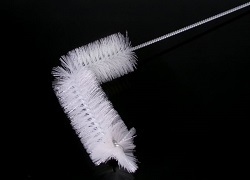 Also called flue brushes, bottle brushes are a type of brush in which the bristles radiate from a central stem and are most commonly used for cleaning hard to reach areas in bottles. Designed for strength and long term use, bottle brushes can also be used to clean holes after drilling; they can also be used to clean air and water purification systems as well as the interior surfaces of test tubes. 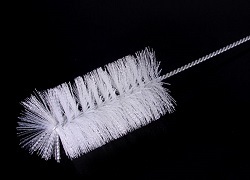 Test tube brushes differ slightly from typical bottle brushes in that they offer tufted ends that provide effective cleaning of test tube bottoms. There are a wide variety of bottle brush configurations because they are designed to work best for various bottle shapes, specifically ensuring the right size to get into the bottle's neck. Typically linear, some bottle brushes are curved to better suit the shape of the bottle. Different bottle types and shapes that bottle brushes are used to clean include water bottles, baby bottles, thermos bottles, vinegar bottles, narrow-necked bottles, coffee cups, carboys, flasks or beakers. Bottle brushes are useful in a broad range of industries including laboratory, pharmaceutical, residential, food processing, industrial, medical, electronics and petrochemical. There are two types of bristle materials commonly used in bottle brushes: metal and nylon. Metal bristles are extremely stiff and are used for heavy scrubbing applications, while nylon is more flexible and is used for lighter scrubbing applications. Metal type materials used for bristles include stainless steel, brass and carbon steel, however nylon bristles are much more commonly used. Bottle brushes use filaments that allow brushes to be impervious so that the bristles do not imbibe dirt, dust or other contaminants. Bottle brushes are a type of twisted-in wire brush and are made by taking a length of wire doubled over, placing the bristles in between the top and bottom of the doubled over wire, and twisting it up similar to a rubber band. Two less common bristle configurations include the bristles being located at one end of the brush, the handle extending from it and the bristles being centered in the wire with two long ends on each side of the wire. The handle is usually the piece of twisted wire and is most commonly made from galvanized steel, stainless steel, aluminum or brass; however, a thicker type of bottle brush may use a sturdier plastic handle.